Popular London Mexican restaurant Wahaca is opening a 5 minute walk from my home and I could not be more excited. The restaurant signs went up earlier in the week and make me happy every time I walk past. Not surprisingly, I’ve been craving Mexican food all week and decided to whip up one of my favourite Mexican treats for dinner last night. 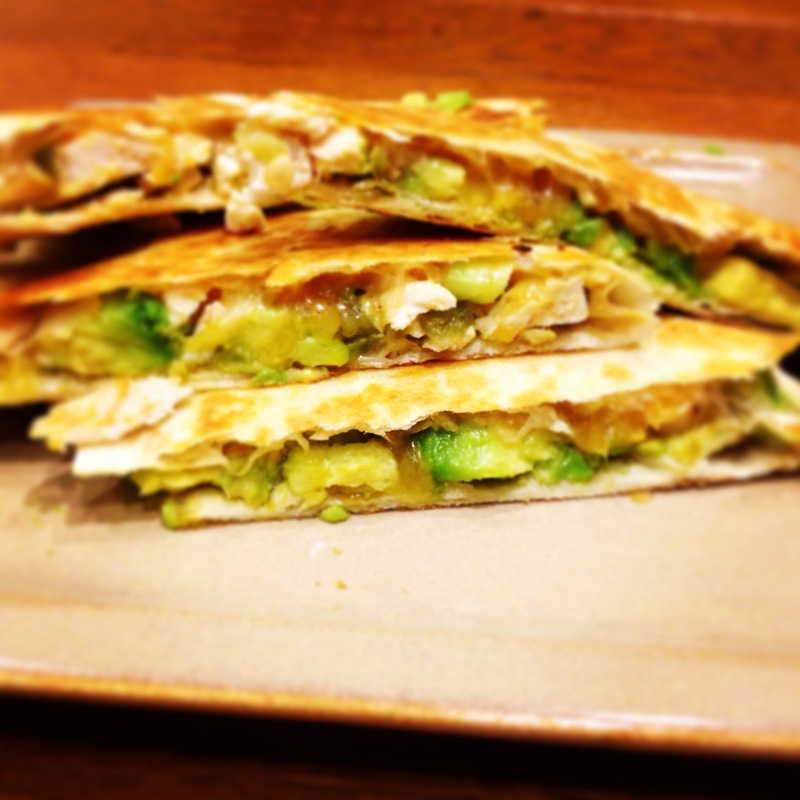 I love the simplicity of quesadillas. ‘Queso’ means cheese in Spanish and a quesadilla is basically a toasted tortilla with melted cheese and any other savoury toppings you fancy. Easy and yummy! Chicken, creamy avocado and a Mexican chilli cheese blend is what I chose and the result was quick and fabulous. Using a fork, lightly mash the avocado, spring onions and jalapeños together in a small bowl. Heat a flat frying pan and lightly grease with butter or olive oil. Place tortilla on pan and warm for a few seconds over medium heat before flipping over to warm the other side. Sprinkle the Mexican chilli cheese on one half of the tortilla. Top with chicken and then add the mashed avocado on top. Reduce the heat and fold the tortilla to make a half-moon shape. Brown one side and then carefully flip it over to brown the other until the outside is crisp and the inside is gooey. Cut up into 4 small triangles and enjoy with a side of hot salsa or Mexican chilli sauce. Vegetarians feel free to substitute the chicken with black beans, refried beans, peppers, spinach or anything else you want. This looks amazing, definitely I am trying vegetarian one. Yes vegetarian will taste really nice but make sure your avocado is ripe. 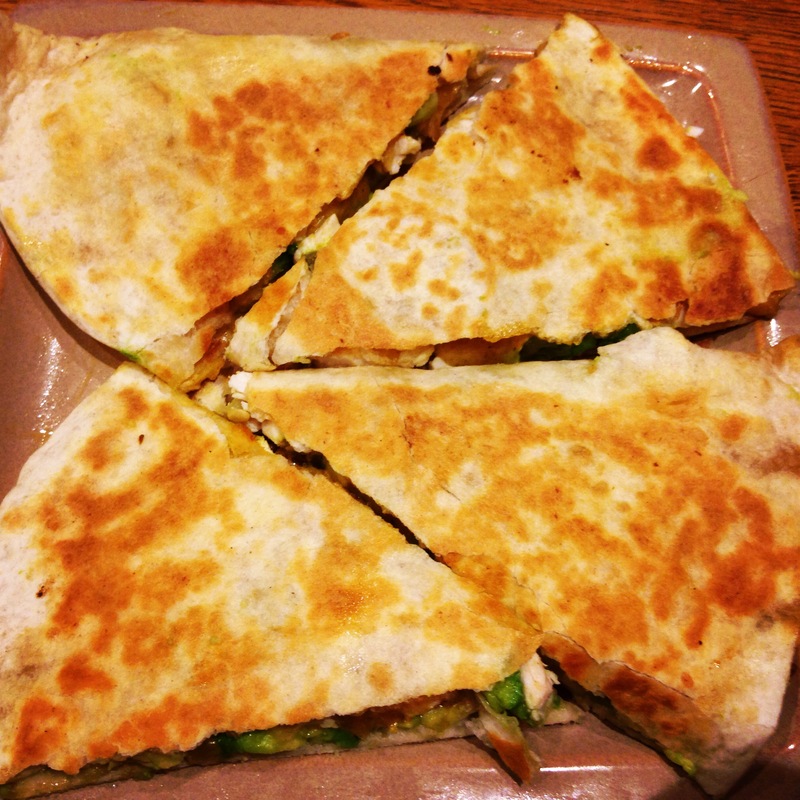 I love a simple spinach and cheese quesadilla too! Thanks Dimps!! Easy and yummy!